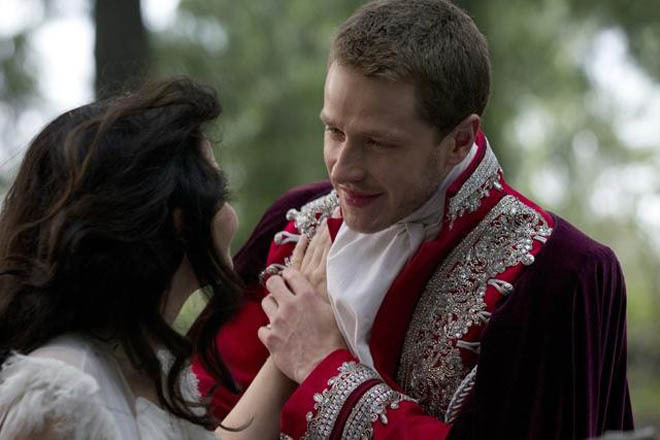 In new fairy tale-infused TV show Once Upon a Time, Ginnifer Goodwin and Josh Dallas portray Snow White and the Prince. During the seven years they spent crafting episodes of Lost, writers Edward Kitsis and Adam Horowitz obsessed over string theory, a mysterious hatch and the karmic implications of black holes, wormholes and limbo. Now they’ve shifted their focus from quantum mechanics to poison apples for Once Upon a Time, a new show that gives fairy tales a modern spin. The series, which premieres Sunday on ABC, catapults Snow White (played by Ginnifer Goodwin), Rumpelstiltskin (Robert Carlyle) and an array of princes, dwarves and evil queens from 19th-century fairy tale land to a small Maine town called Storybrooke. Stripped of their happy endings and quaint costumes, the characters plod through ordinary lives without any memory of their extraordinary true identities. That sandbox has suddenly become awfully crowded. Filmmakers, TV auteurs and other artists with an itch to get beyond the current glut of vampires, zombies and comic book characters are ransacking fairy tales to create updated takes on mythic heroes and villains. Why have 200-year-old stories suddenly become hip again? Kitsis said fairy tales cast an especially strong spell over the public imagination these days because of one ogre that just won’t go away: the floundering economy. For an entertainment-industrial complex under increasing pressure to cut costs, fairy tales offer an added benefit. Unlike contemporary novels, comic books and other expensive intellectual properties, rights to fairy tales cost nothing. From a marketing perspective, these public domain narratives boast deeply embedded “brand name” recognition that goes far beyond anything that could be drummed up by a blitz of billboards and TV trailers. The price is right, but contemporary storytellers also flock to fairy tales because the fabulist material lends itself to such varied interpretation. For example, Once Upon a Time draws on Disney-style iconography made famous in animated pictures that often sweetened fairy tales for family consumption. Meanwhile, showrunners for Grimm, NBC’s upcoming series that re-imagines the Brothers Grimm as history’s first criminal profilers, stress the darkest elements of the German fairy tales. “Going back to the original Brothers Grimm Cinderella story, the stepsisters cut off their toes to fit into the shoes and they get their eyes pecked out by crows and you’re like, ‘Oh, this is a little darker than I remember,’” said Grimm co-creator David Greenwalt, who worked as a showrunner for vampire series Buffy the Vampire Slayer and Angel, in a phone interview with Wired.com. In Grimm, which premieres Oct. 28, detective Nick Burkhardt (David Giuntoli), a descendent of the Brothers Grimm, learns he has inherited the ability to perceive the Big Bad Wolf that lurks beneath human exteriors. Each episode will reference stories like the Three Little Pigs, Goldilocks and the Pied Piper “in ways you’ve never seen them before,” promised Greenwalt. The ability to tweak well-known characters for modern times makes fairy tales particularly seductive. Grimm, for instance, will present Little Red Riding Hood as an innocent, hoodie-wearing tween snatched by a mild-mannered mailman who likes to eat children for dinner, while Once Upon a Time positions its version of the character as a Goth malcontent. “She’s a very naughty girl,” teases Once Upon a Time’s Horowitz. Some contemporary filmmakers plug fairy tales’ mythic structures into their own stories, as Guillermo Del Toro did in his Oscar-nominated Pan’s Labyrinth. Director Nicolas Wending Refn likewise reacquainted himself with the Brothers Grimm repertoire while prepping his art house heist movie, Drive. Recasting fairy tale iconography in contemporary context has become popular with artists as well. Camille Rose Garcia, who grew up around the corner from Disneyland, envisions Snow White as a bitter shrew surrounded by terrified forest creatures in her upcoming book of fairy tale-inspired art, Mirror, Black Mirror. French illustrator Winshluss, in his recent graphic novel version of Pinocchio, reconfigured the adorable puppet/boy as robot child whose adventures with a greedy Geppetto, a gnarly vagrant and a sadistic, clown-faced politician are anything but whimsical. It’s all about making the old new again. As psychologist Bruno Bettleheim argued in his landmark 1986 study The Uses of Enchantment, the best fairy tales address primal fears with such pitch-perfect efficiency that they never become dated. In The Hero With a Thousand Faces, the book that provided George Lucas with the structural blueprint for Star Wars before becoming a primary text for Hollywood storytellers, mythology expert Joseph Campbell observed that fairy tale archetypes accommodate the deeply rooted human need for heroes and villains. Unlike the dread-filled future worlds proffered by dystopian science fiction, stories rooted in the past tacitly endorse the comforting notion that humans can conquer monsters, then live to fight another day. As Kitsis puts it, “These are scary times.” With debt crises and widespread discontent driving people into the streets, there’s no happy ending in sight. With their timely promise of better days to come, rejiggered fairy tales still have plenty to say.